Despite the neighborhood-centric focus that’s become a hallmark of political stump speeches, the city doesn’t have a tally of how many neighborhoods there actually are. Neighborhoods are getting lots of lip service in the mayoral campaign but just how many the city has – or how they should be defined in the first place – is largely subject to interpretation. That’s what I found as I tried to evaluate a claim by mayoral contender Nathan Fletcher at a recent debate. “We’re here to partner with all the 52 neighborhoods throughout San Diego to rebuild the infrastructure, to restore the trust and to get our city moving forward again,” Fletcher told attendees at a Sept. 28 gathering in Logan Heights. His comment stirred some conversation between planning and media types on Twitter. Joe LaCava, who chairs the citywide community planning committee, shared multiple counts he’d seen over the years; former Assemblywoman Lori Saldaña and freelance journalist David Ogul speculated about neighborhoods they thought might be included or left out of various estimates. 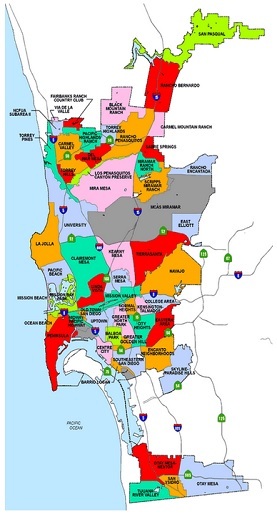 Indeed, confirming how many neighborhoods San Diego has proved tricky despite the city’s emphasis on its unique communities. Not only is the city without a formal definition for them, but various maps and analyses over the years have come to different conclusions. A 2011 report by the city’s redistricting commission listed about 135 neighborhoods within the city’s nine City Council districts but counted a few neighborhoods twice because they fall within two political territories. The Police Department’s beat map, on the other hand, names about 125 neighborhoods. And then there’s the city’s map of 52 communities. Note that I wrote communities, not neighborhoods. The map you’re looking at actually features community planning areas, or regions where the city has worked with or plans to work with residents to develop specific blueprints for future growth. Some of them are what regular folks (Read: not urban planning types) might consider neighborhoods. Some of those community planning areas include well-known neighborhoods. For example, Hillcrest is in the Uptown planning area. But the city doesn’t have a formal list of its neighborhoods and doesn’t have any immediate plans to create one, said Nancy Bragado, interim deputy director for long-range planning in the city’s planning department. That’s partly because the city hasn’t hashed out all neighborhood boundaries – or even decided what an area must have to be considered one. Instead, planners have largely relied on natural and unnatural boundaries like freeways or canyons, and on residents to say where neighborhoods exist. Residents get to share their ideas with city planners when they work on community plans, which make their way through both the area’s community planning group and the City Council. The bottom line: “Neighborhood boundaries are more subject to interpretation except where they’re defined in community plans,” Bragado said. Knowing the number of neighborhoods wouldn’t have a significant effect on the city’s approach to neighborhood planning, so it’s not something city staffers have pushed. And that means that unless the city decides to specifically designate them, we may never know for sure just how many neighborhoods it actually has. At least for now, Fletcher seems to have decided to stick with the only number city planners are circulating: the city’s 52 community planning areas.